"Bruno Proudly Gives a Legend a Lift"
Bart and Cherry Starr’s Bruno story is one of love. Love for one another. Love of the game. Love of helping others. Most know Bart as one of the greatest NFL quarterbacks of all time, MVP of Super Bowl I and II, and Hall of Fame Inductee. His “first love,” however, far outshines his storied 16 seasons with the Green Bay Packers. Bart and Cherry dated in high school and secretly eloped in college. After nearly 63 years of marriage, their unwavering bond is palpable to anyone in their presence. In recent years, Bart has suffered two strokes, a heart attack and other health issues, but their love for one another and football hasn’t diminished. (Above) Bart and Cherry Starr enjoy their Bruno stairlift. Bart, 83, and Cherry, built a media room to enjoy football games with friends and family before his strokes. Afterward, negotiating the stairs wasn’t possible for Bart. Cherry had a Bruno stairlift installed, so Bart could once again join in game day fun. Losing abilities as we age is difficult. It would be understandable if Bart wanted people to remember him as the man immortalized as a bronze statue in Green Bay. But complementing his love for Cherry and football, is Bart’s love for helping people. 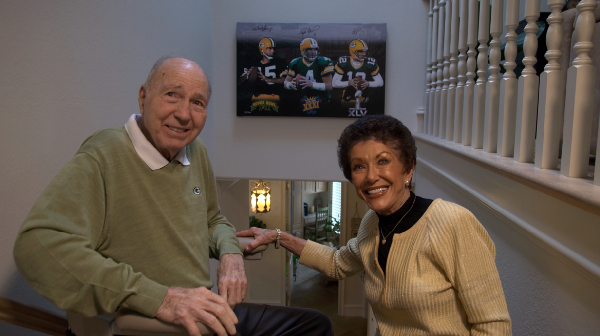 In fact, there’s an “Athletes in Action-Bart Starr Award” bestowed annually at the Super Bowl breakfast to honor the NFL player who exemplifies outstanding character and leadership in the home, on the field and in the community. Rather than keeping his health challenges private, the Starr’s want others who have mobility challenges to know equipment like a stairlift exists and can positively impact a person’s quality of life by allowing easy access to the entire home. Thank you Bart and Cherry for choosing Bruno — built in Wisconsin (by Packer fans, of course!) — and sharing your story.